The weed/flower Queen Anne’s Lace is actually a wild carrot. Many say carrots were planted in colonial gardens; went to seed & soon spread across North America. I love carrot cake! here we say “karottenkuchen” :). A blog about soup and now I’m reading about one of my all time desserts, carrot cake! You can never go wrong with carrot cake, at least at my home! I LOVE CARROT CAKE. Almost as much as banana cake. Ordered carrot cake for my birthday, and sadly, although from a reputable bakery, it was a disappointment. Too many spices and not enough density or chewy things. Anything more frustrating than a much anticipated and disappointing cake? So sorry to hear that. You know what i say. I you don’t get exactly what you ordered…cook it yourself. Have a great week. I despise carrots, but LOVE carrot cake! 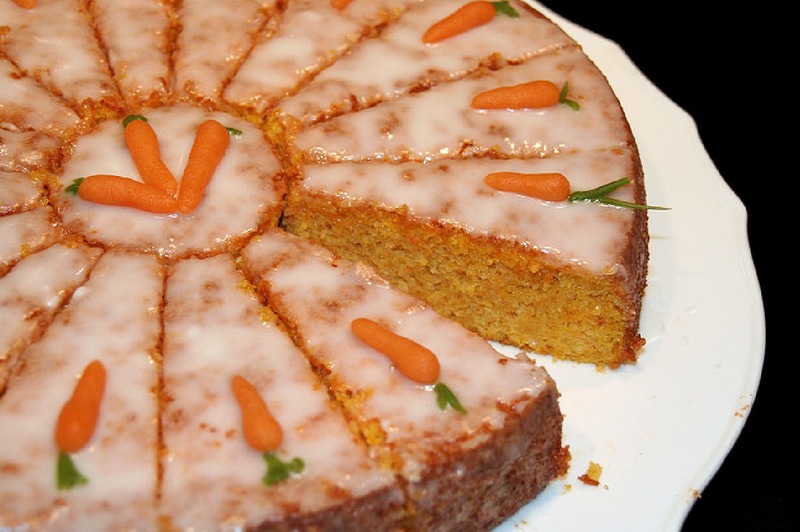 Who ever KNEW there was such a thing as Carrot Cake Day? Wow, this blog is impressive – it’s a little like what I’m wanting to do with mine and then a whole lot more. Looking forward to seeing what’s next! I am new to the blogging world! But I enjoyed your post. Better grab those carrots fast because apparently they are the largest selling item pre game day! First let me say You are my hero. Your blog is amazing. Although I’m just starting out in the blogging world I strive to have my blog be as good as yours. Second, thank you for following my blog. Reblogged this on Honoring Your Good Life. That carrot cake looks divine! Wicked, smart background. I love an Italian pantry. Thanks you thank you. It’s personal pantry! Yep, I cook too. i so love carrot cake! I love this! It better than a daily horoscope. Thanks for dropping by my blog :) and I’m glad you did because your blog looks wonderful! Time to brush up on my food knowledge! Thanks for following…….Have tried the dog on carrots and he has refused!! Well, I didn’t even know it was national carrot cake day but had serendipitously planned to make one! Thanks for following my blog. What a beautiful blog you have!! I’m so excited to read, and learn, and undoubtedly love everything here. Thank you for all you do! I’m not too fond of carrot cake, but there’s one Indian dessert made from carrots that you have to try – ‘gajar ka halwa’. Might be a bit too sweet for Western tastes, but it’s one of my “stuff your mouth till you eat too much” dishes. Ah man… I LOVE carrot cake almost as much as I love your blog!!! I only wish I had time to make a carrot cake today. Maybe tomorrow!!! I’ll post a pic if I do! i like your page, everyday is a food celebration!